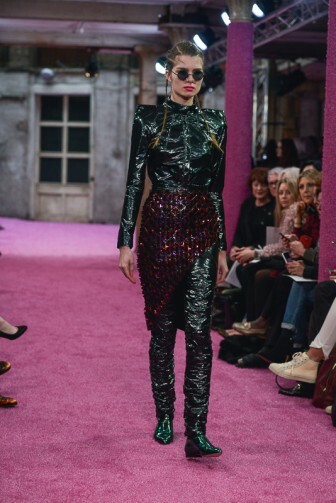 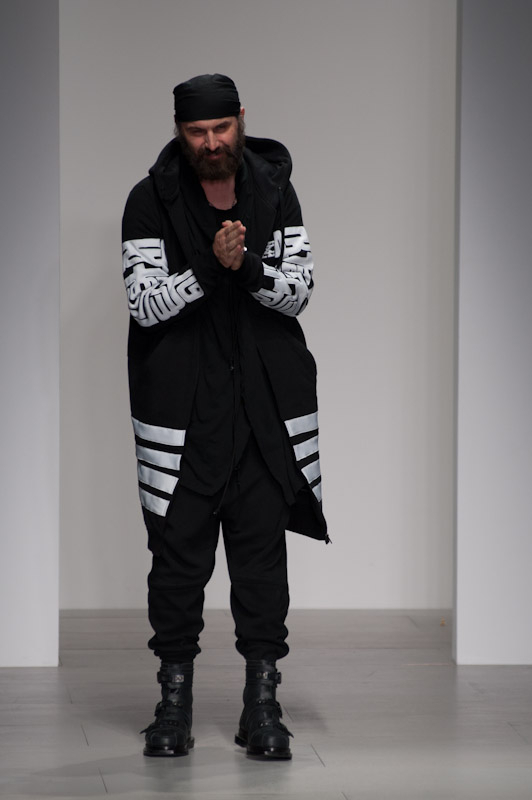 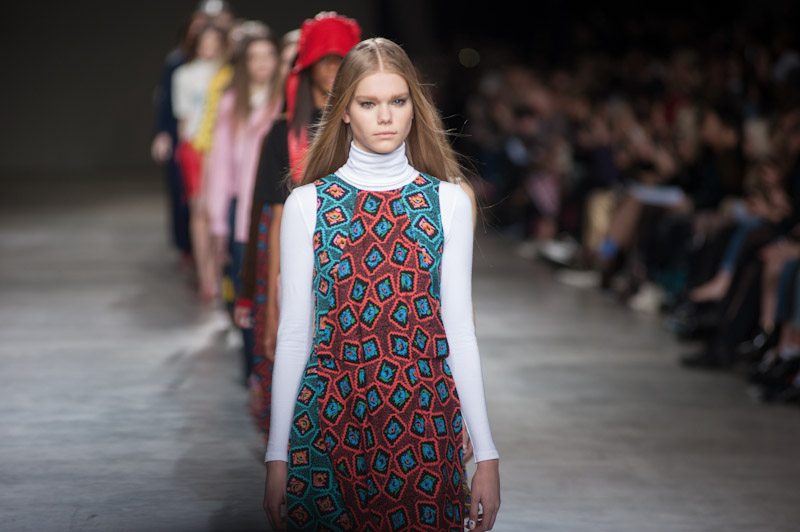 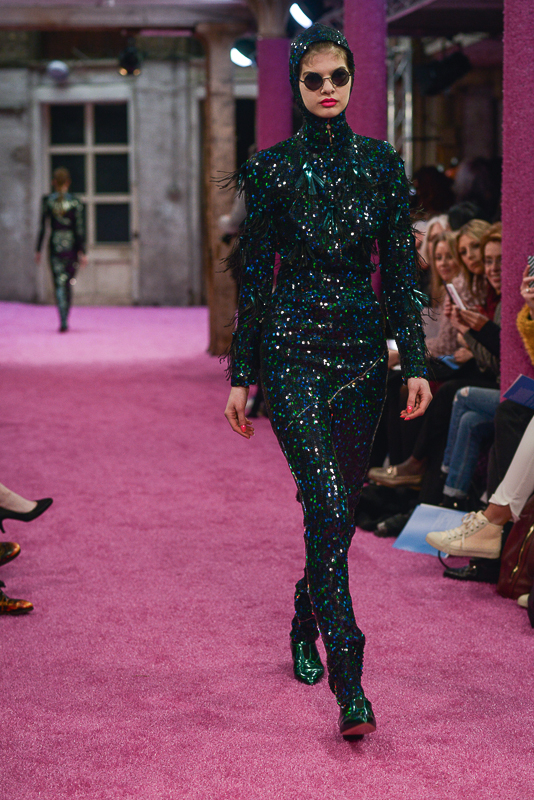 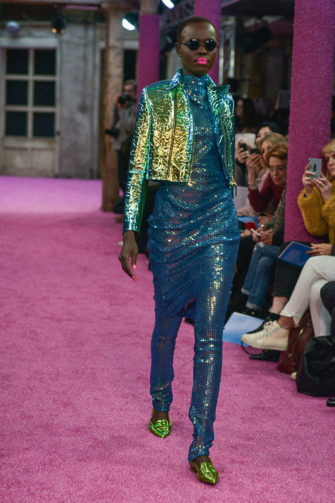 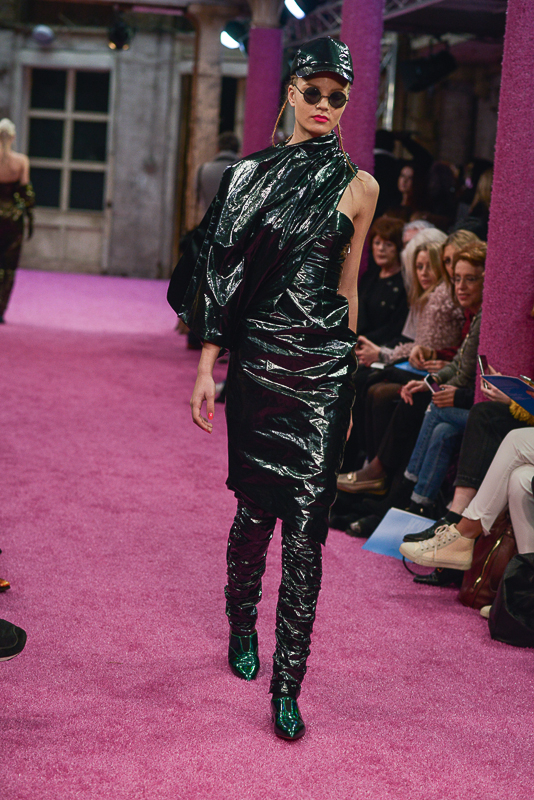 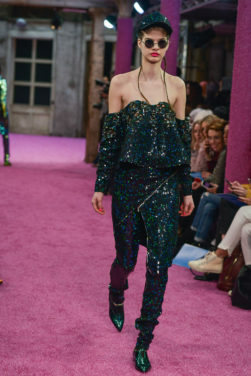 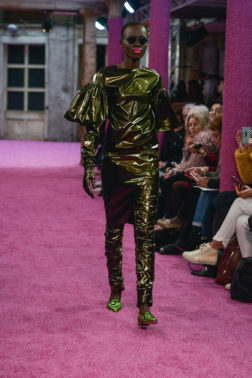 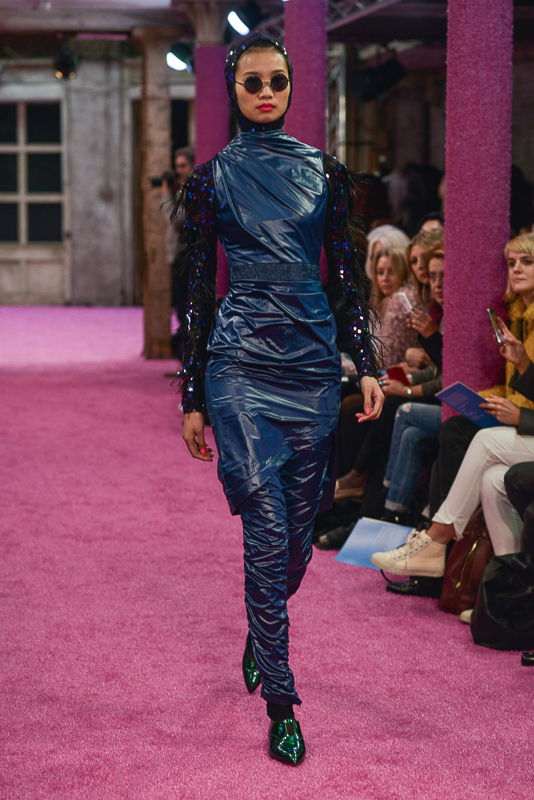 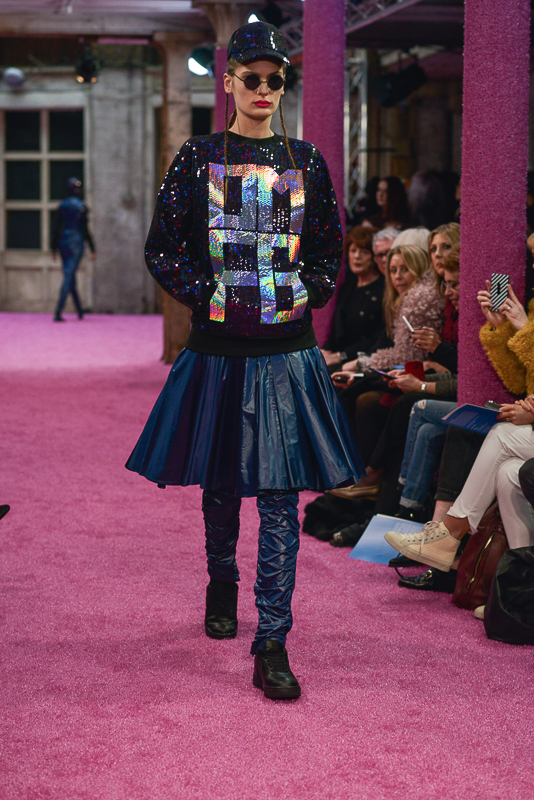 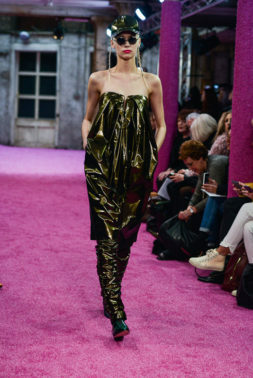 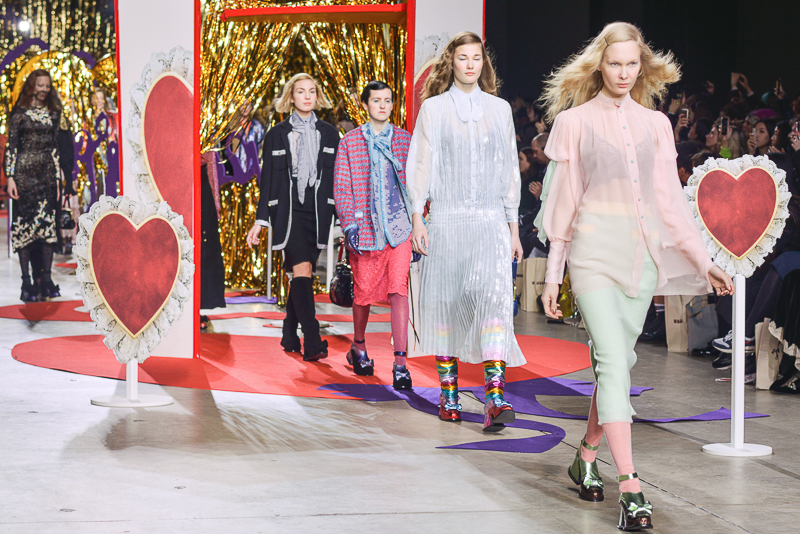 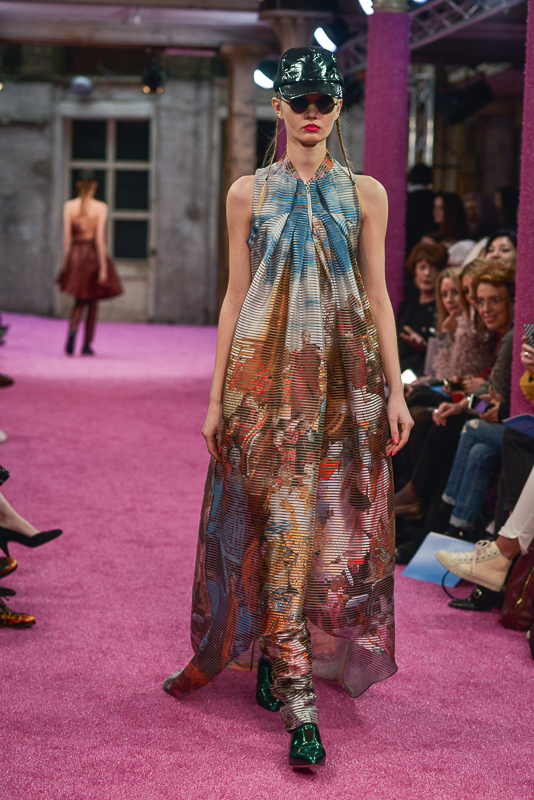 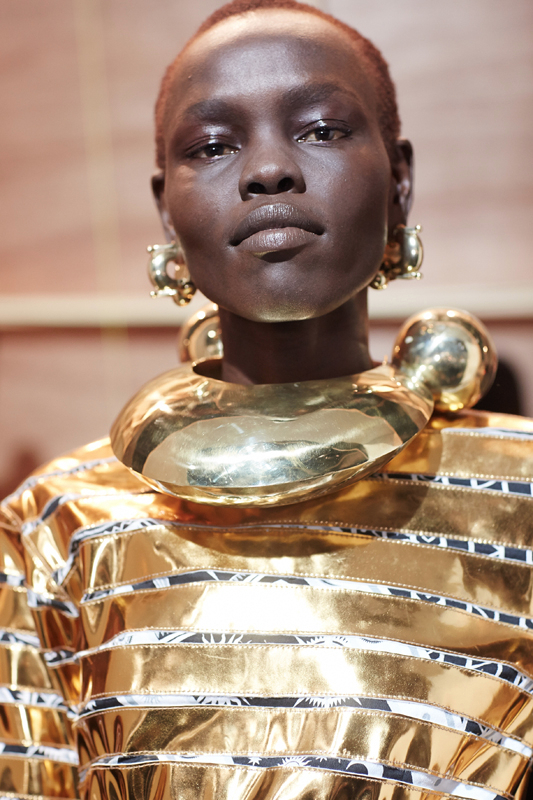 Set in trendy east London’s Farmiloe Building, Fyodor Golan’s autumn/winter 2014 collection catwalk was heading for something out of the ordinary before it had even begun. 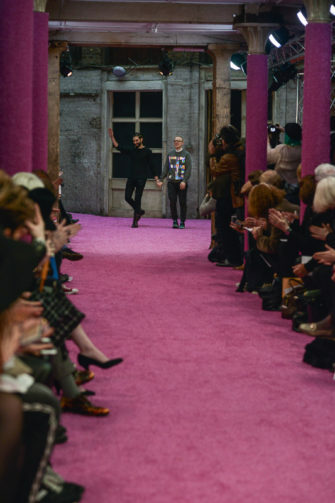 And much to the spectators’ enjoyment, the design duo created a façade fabulously fantastic enough to keep one’s attention from the very moment it set off, straight through to the end. 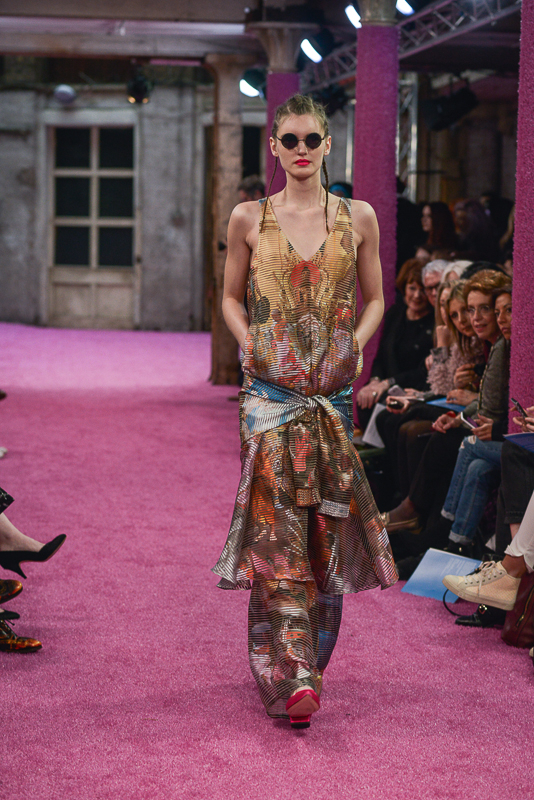 Influenced by the pair’s travels throughout Myanmar and Cambodia, the surreal designs reflect the movement of the wild jungle. 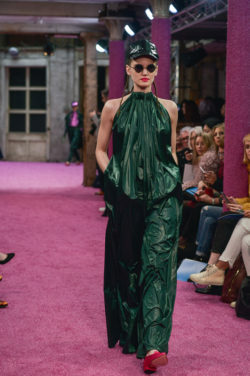 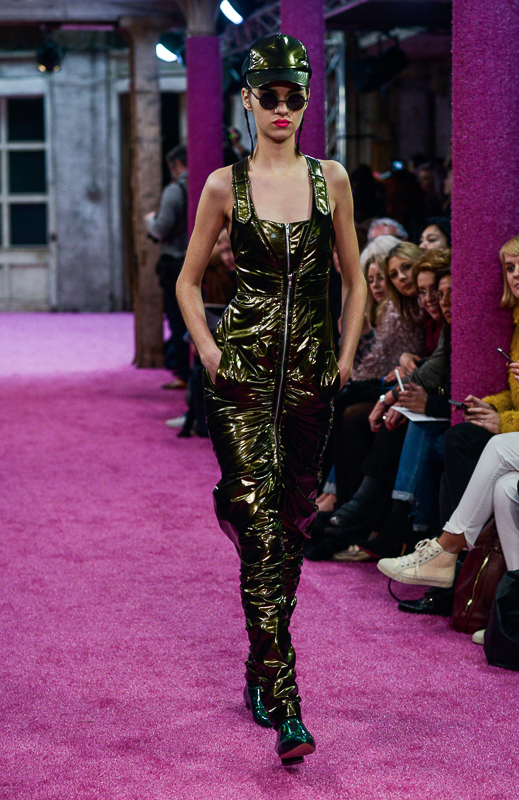 Endless hues of metallic greens embroidered with sequins drape the models, reflecting the exact movement and freedom within a jungle, whilst the olive and petrol greens represent the typical jungle landscape palette. 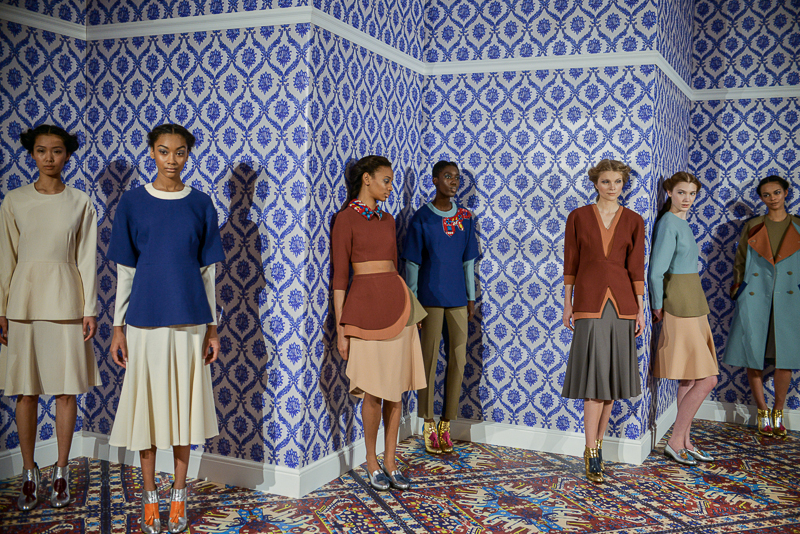 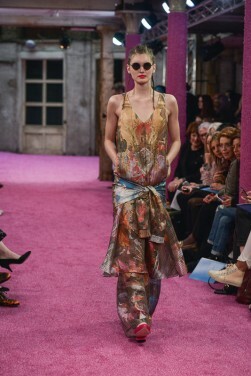 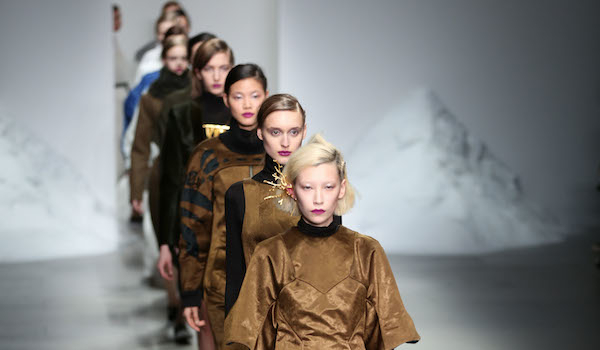 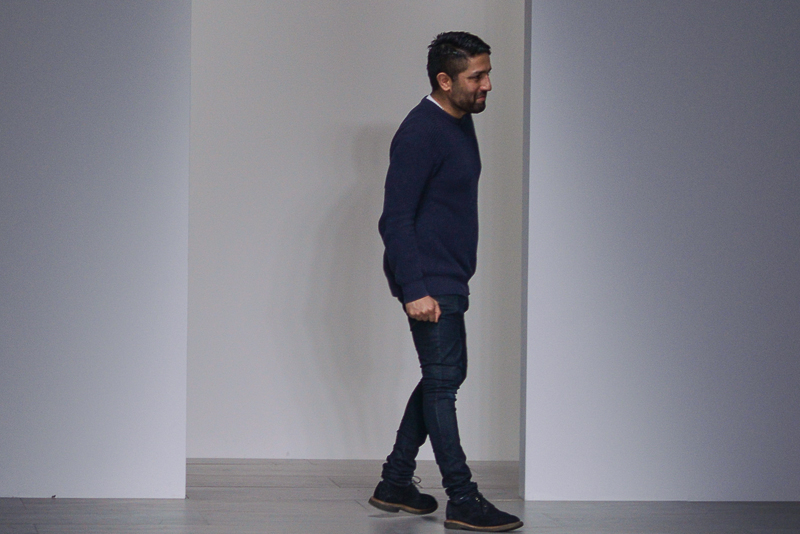 As the show progressed, so did the extravagance. 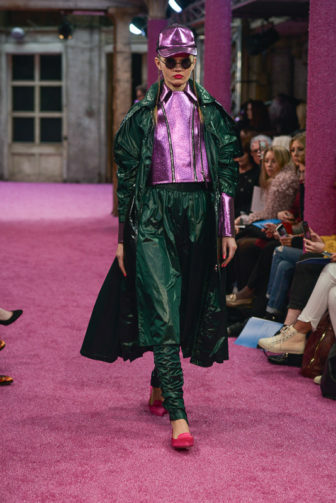 Strikingly flamboyant pink and green metallics set a base for the collection, as well as for the pair’s exquisite design experimentations. 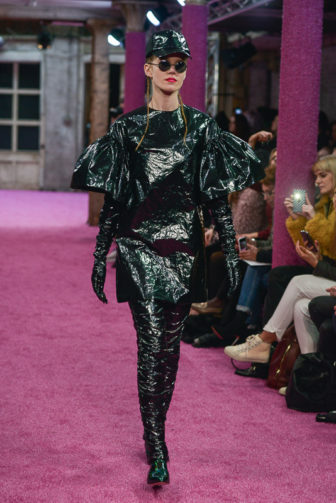 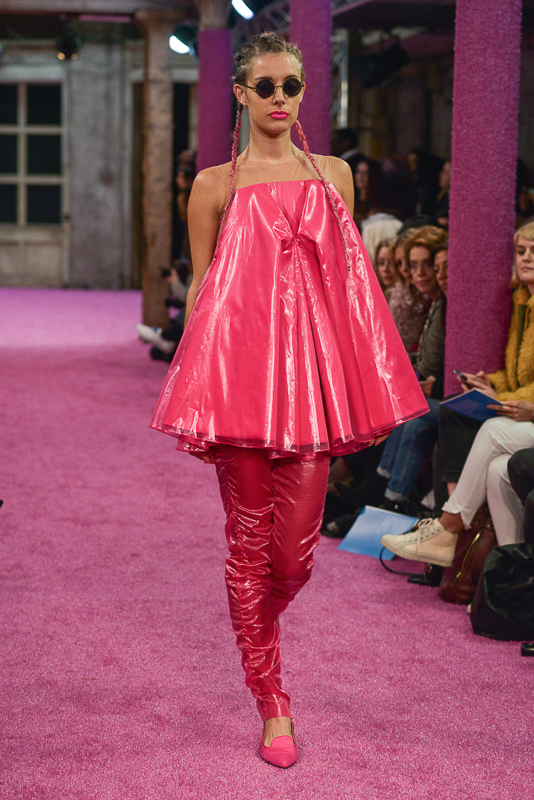 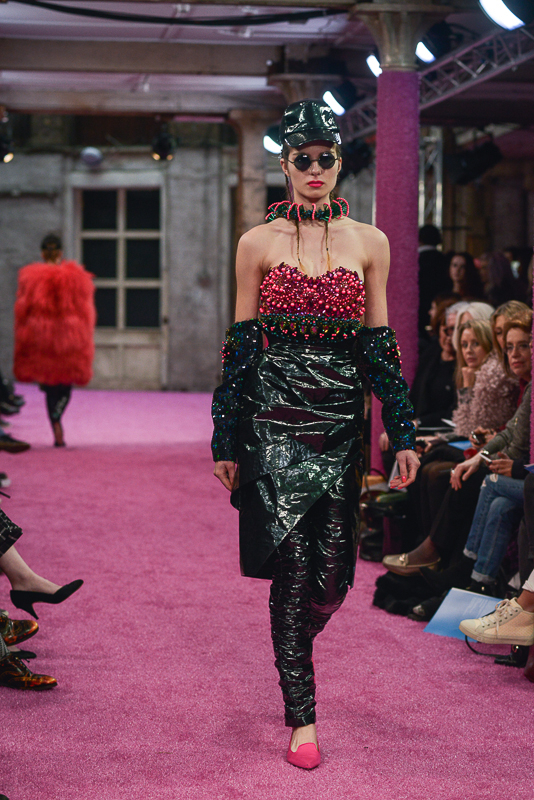 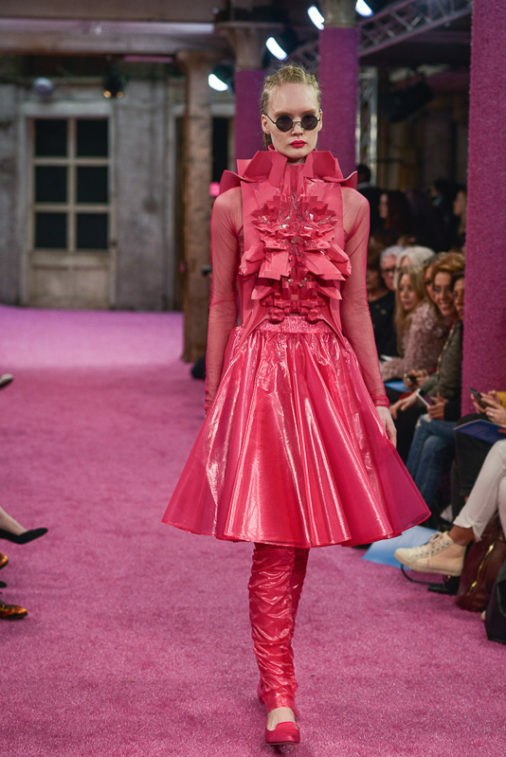 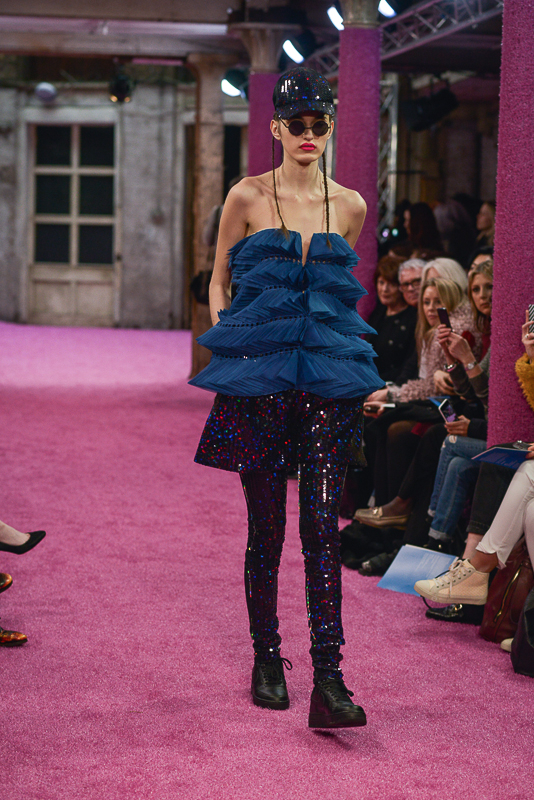 Organza frills, tulle sleeves, foil finishings and Swarovski crystals embossed on the pieces adorned the suitably hot pink catwalk. 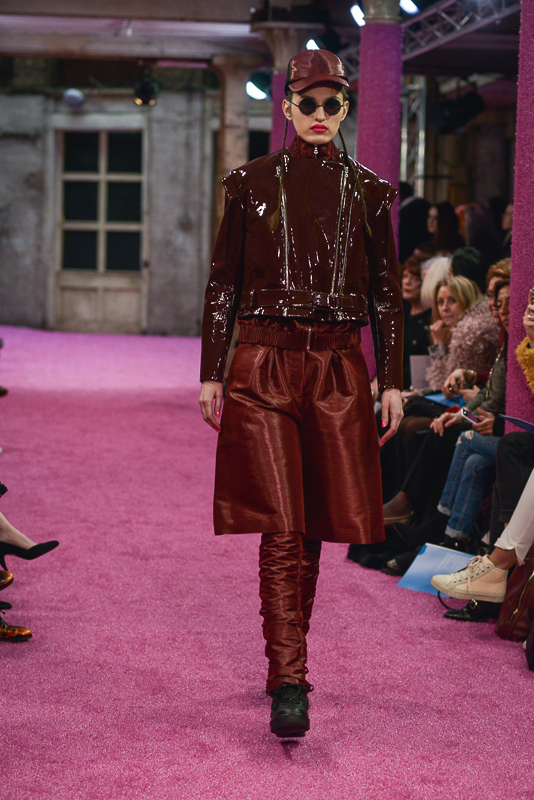 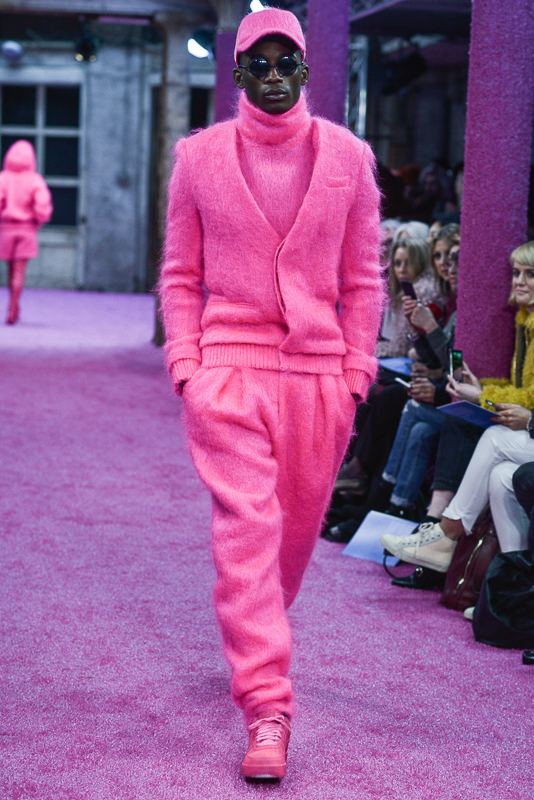 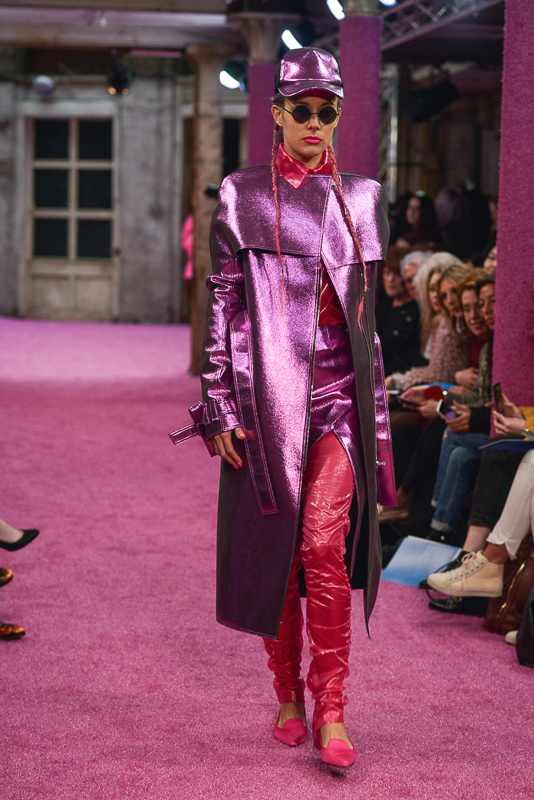 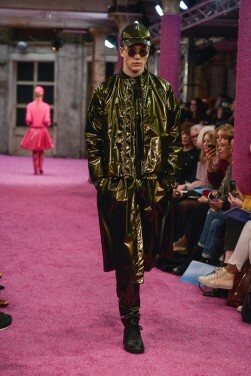 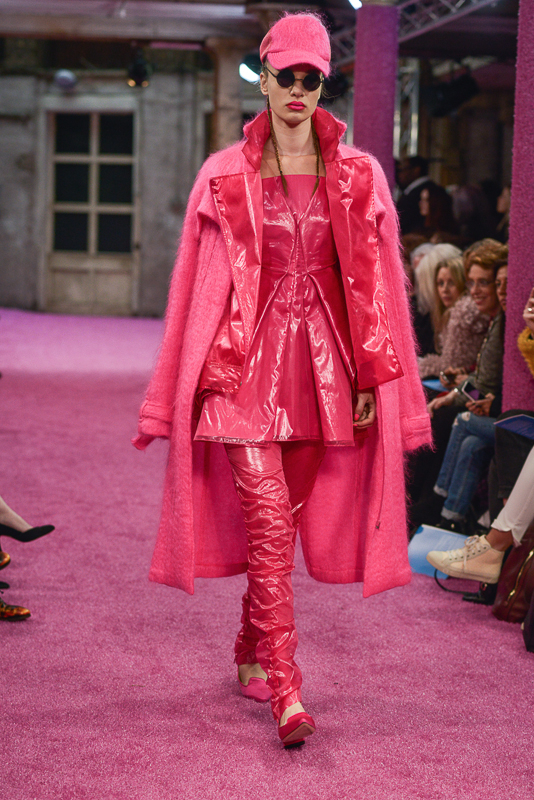 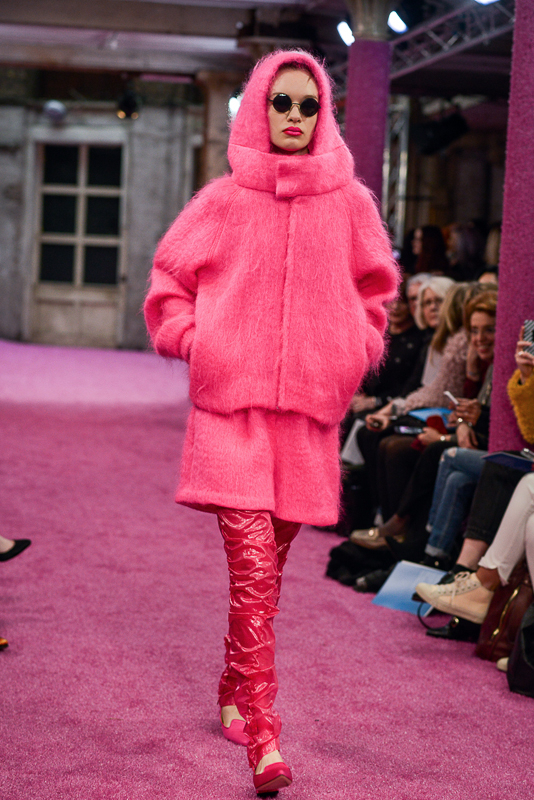 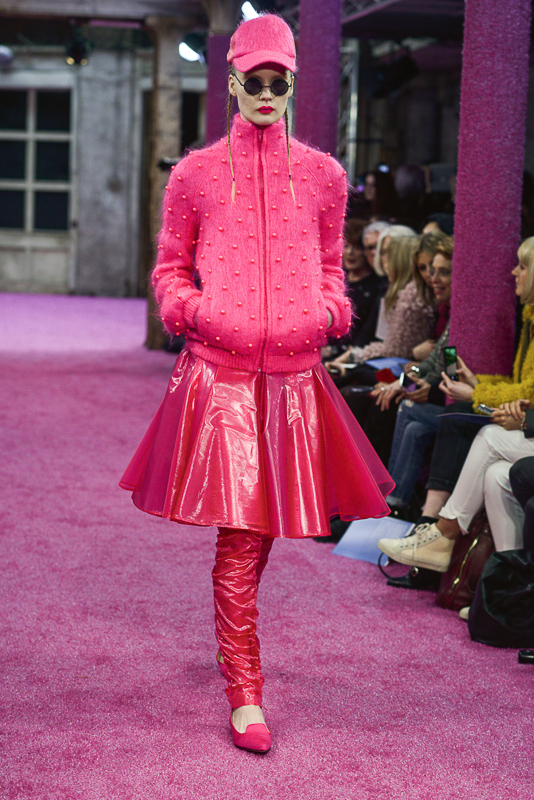 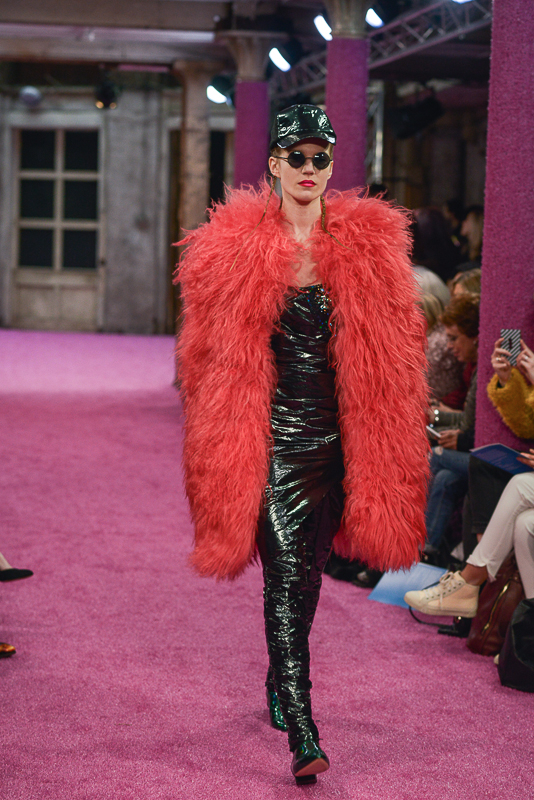 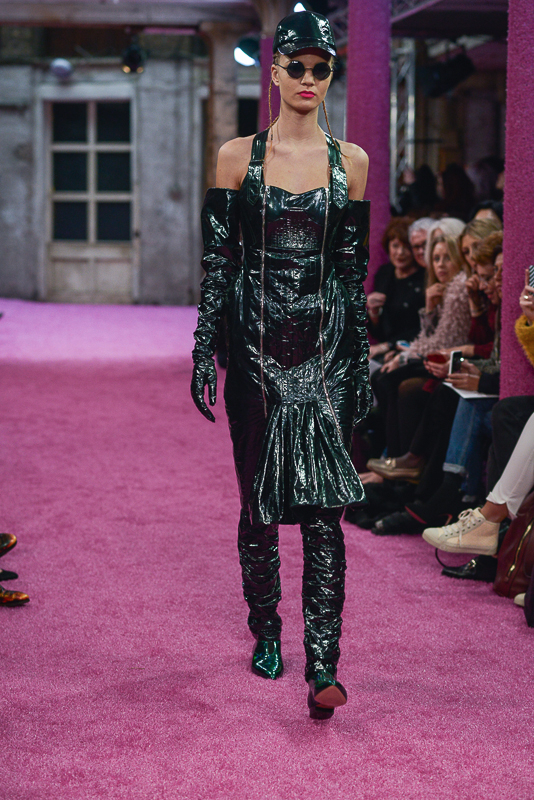 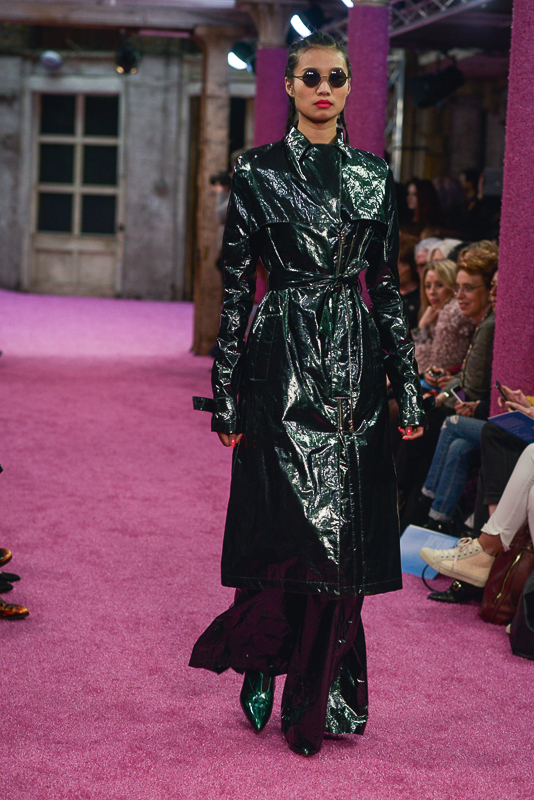 An almighty fuschia sheepskin coat paired with PVC trousers, as well as an olive green all-over jewel-embossed suit are just a few of some of the most visually captivating designs the duo presented to us. 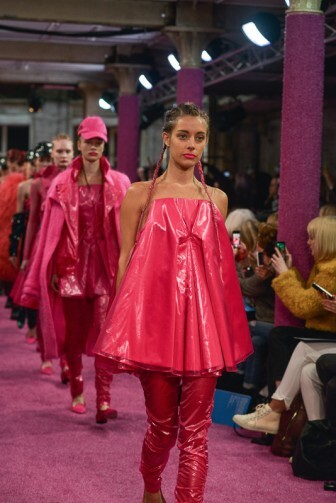 Rounding off with a finale to Judi Garland’s Somewhere Over the Rainbow, it’s clear the designer pair were hoping for the fantasy element. And that’s just what they achieved!